No matter how big or small your job, DC will do a great job at an affordable price! Call us today on 021 881 558 and we will provide answers to any questions you have and a FREE quote. 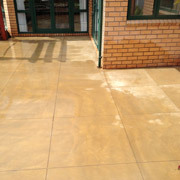 Concrete can be coloured by addingoxides to the concrete mix. There are a wide range of coloured oxides to choose from, allowing you to choose the colour that best suits your project. Exposed Aggregates are achieved by washing away the top layer of cement to leave the surface layer of aggregate exposed and then varnishing the surface to give a long lasting finish.Click to find out more. Patterned or textured or embossed to resemble brick, slate, flagstone, stone, tile, wood, and various other patterns and textures, stamped concrete is commonly used for patios, sidewalks, driveways, pool decks, and interior flooring. 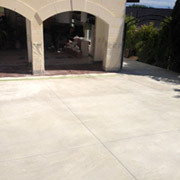 Covercrete can transform cracked, stained or exposed concrete surfaces. 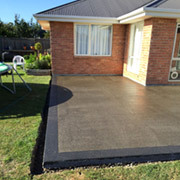 Covercrete is a 3 to 4mm concrete re-surfacing product, suitable for indoor and outdoor use in domestic or commercial applications. Decorative Concrete were great right from the start. 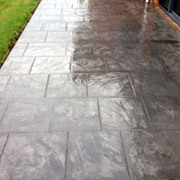 Sam came and talked through all the options for our driveway and paths and we chose a dark exposed aggregate. The DC guys came around and made light work of the preperation (even though my drainlayer had left a hell of a mess behind) and now our drive and paths look stunning. On time and on budget. I can't fault them! Cheers. Rory, Sydenham, Christchurch.